WHAT IS THE SAFE SOLUTION�? IT IS NOT A NON-SKID PAINT NOR IS IT AN ANTI-SLIP COATING!! When water or grease puddle on non-porous hard mineral surfaces, you are actually hydroplaning on the film of water or contaminants. It is similar to a bold car tyre on a wet road surface which would be very slippery. 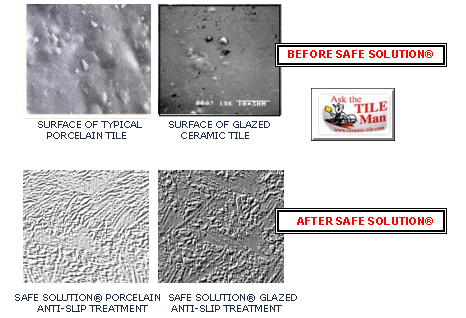 After THE SAFE SOLUTION� anti slip treatment system is applied, microscopic channels are created for the water and oils to be disbursed from under foot, allowing you to make contact with the surface at all times. To the naked eye and touch, the surface is virtually unchanged when dry. Please note, this process is a permanent solution to change a slippery surface to an non slip and can not be "undone". "THE SAFE SOLUTION� DRAMATICALLY INCREASES TRACTION TO EXISTING SURFACES"
Coefficient of Friction is the ratio of the tangential force required to move a body across a horizontal surface to the vertical load imposed on the surface by the body. Friction is an intrinsic property of the two interfacing, interacting surfaces resulting from their micro- and macro-roughness, inter- and intra-molecular forces of attraction and repulsion, and their visco-elastic properties. Slip Resistance is the frictional force opposing movement of an object across a surface, usually with reference to the sole or heel of a shoe on a floor. In Australia the product has been independently tested by the CSIRO and other NATA accredited testing agencies and on glossy tiles has achieved up to 350% improvement in slip resistance. * WHEN COMBINED WITH OUR FSMP PROGRAM AND USING OUR * MAINTENANCE SOLUTION� CLEANER.